Ch. 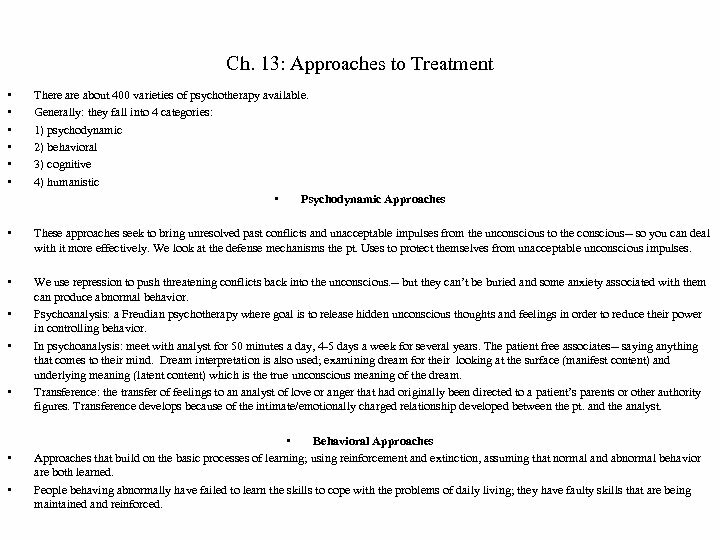 13: Approaches to Treatment • • • There about 400 varieties of psychotherapy available. Generally: they fall into 4 categories: 1) psychodynamic 2) behavioral 3) cognitive 4) humanistic • Psychodynamic Approaches • These approaches seek to bring unresolved past conflicts and unacceptable impulses from the unconscious to the conscious-- so you can deal with it more effectively. 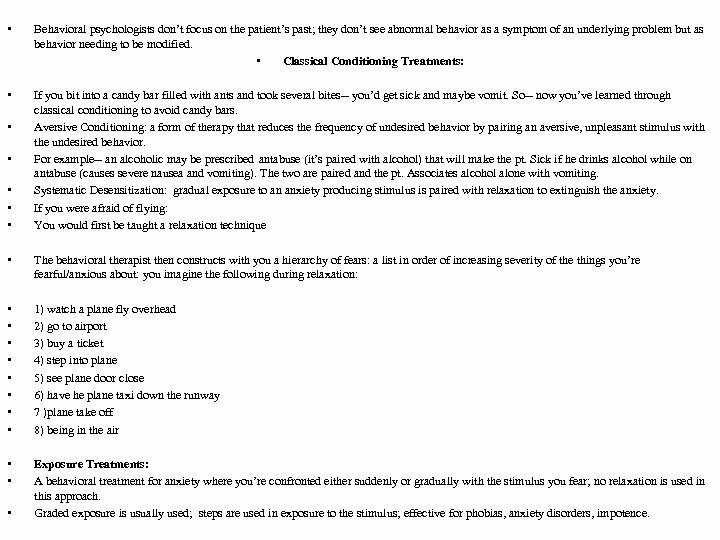 We look at the defense mechanisms the pt. Uses to protect themselves from unacceptable unconscious impulses. • We use repression to push threatening conflicts back into the unconscious. -- but they can’t be buried and some anxiety associated with them can produce abnormal behavior. Psychoanalysis: a Freudian psychotherapy where goal is to release hidden unconscious thoughts and feelings in order to reduce their power in controlling behavior. 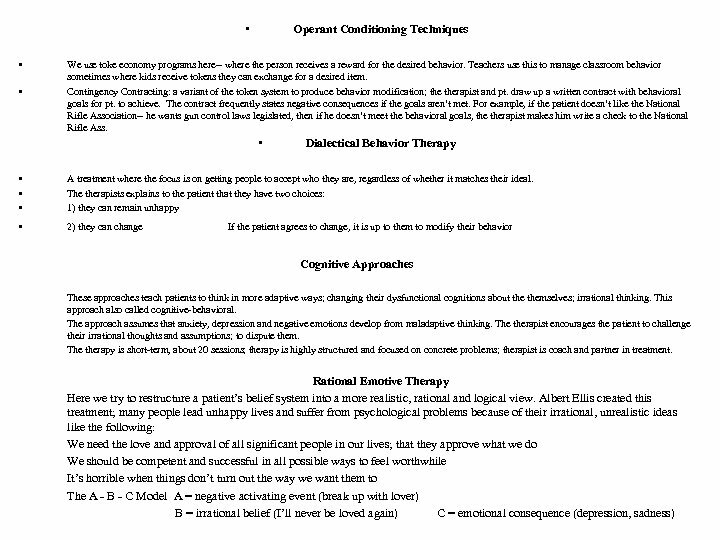 In psychoanalysis: meet with analyst for 50 minutes a day, 4 -5 days a week for several years. The patient free associates-- saying anything that comes to their mind. Dream interpretation is also used; examining dream for their looking at the surface (manifest content) and underlying meaning (latent content) which is the true unconscious meaning of the dream. Transference: the transfer of feelings to an analyst of love or anger that had originally been directed to a patient’s parents or other authority figures. Transference develops because of the intimate/emotionally charged relationship developed between the pt. and the analyst. • • • Behavioral Approaches that build on the basic processes of learning; using reinforcement and extinction, assuming that normal and abnormal behavior are both learned. People behaving abnormally have failed to learn the skills to cope with the problems of daily living; they have faulty skills that are being maintained and reinforced.